Methochloride salt form of (+)-bicuculline. Freebase, methiodide and methobromide salts also available. The GABAA receptor antagonist bicuculline is commonly used to reduce levels of inhibition by blocking the actions of the neurotransmitter GABA. It is commonly used at concentrations of 100 μM and above. 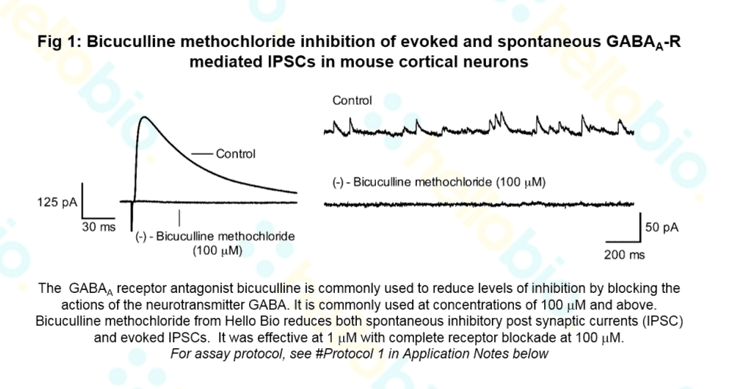 Bicuculline methochloride from Hello Bio reduces both spontaneous inhibitory post synaptic currents (IPSC) and evoked IPSCs (see Fig 1 above). It was effective at 1 μM with complete receptor blockade at 100 μM. Neurons were held at 0mV and IPSCs continuously stimulated and recorded in response to 5 min applications of varying concentrations of Bicuculline methochloride until complete receptor inhibition. Spontaneous IPSCs were recorded before and after addition of Bicuculline methochloride by holding the neuron at 0mV and recording for 10 sec. 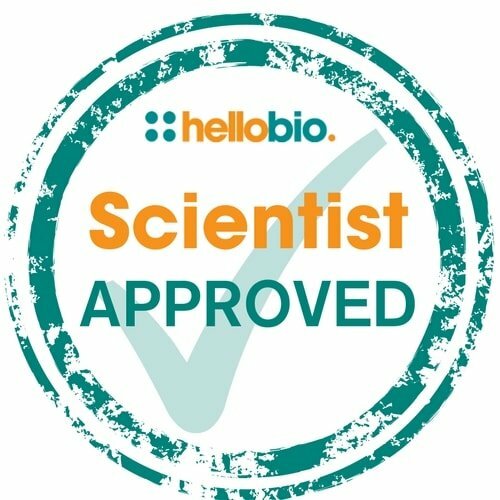 The following papers have cited the use of (-)-Bicuculline methochloride (HB0895) from Hello Bio. If you have published a paper using this product, and it is not shown here, then please tell us! We will send you a free gift as a thank you! Neurotoxicity of propofol on rat hypoglossal motoneurons in vitro. We highly recommend (-)-Bicuculline methochloride: good results, low price, fast delivery. We used to buy our drugs from very big companies, but as the delivery delay was quite important, we switched to Hello Bio. We are very satisfied with the results obtained thus far with all Hello Bio drugs we have tried. We highly recommend (-)-Bicuculline methochloride: good results, low price, fast delivery. We used to use (-)-Bicuculline methochloride from another company, this one is much cheaper and works very well.